Now it's time to check in with the brutish villain of Porgy and Bess, Crown, played by the young American baritone Michael Redding. Michael--who, in real life, is neither brutish nor villainous--tells us about finding the humanity in the bad guy, what he has learned from Meryl Streep and Nina Simone, and which song from Porgy and Bess he'd most want to perform. You’re new to Seattle Opera...welcome! Can you tell us a little about your background? We’d love to know where you’re from, how you became involved in opera, and some of your favorite roles. I come originally from the Atlanta area in Georgia, but I reside in Chicago. During audition season, while doing grad work at Indiana University, I would travel to Chicago and simply fell in love with the city. We freelance singers always need a major airport to get from one engagement to the next, so I chose Chicago! In regards to becoming involved with opera, I think it just kind of fell in my lap. People tried to steer me in the direction of musical theater, but I originally thought I was destined to be a professional choral singer (whatever that meant) because that’s what I grew up thinking, ie: Robert Shaw Chorale, etc. However, my first voice teacher quickly set me straight by helping me to uncover my voice and my love for the art form. I love all types of theater, but learning operatic roles and being on those particular stages is home for me. And I think it’s safe to say that every role is my favorite! It’s not so much what the role is, as much as it is what part of Michael Redding is in that role. So Crown and Marcello, to me, are one and the same! 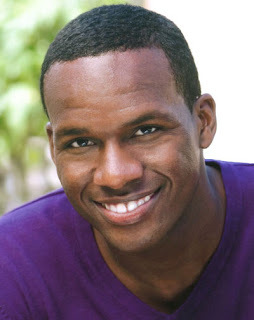 Michael Redding as Crown in Seattle Opera's production of Porgy and Bess. What was your first experience with Porgy and Bess? Crown isn’t necessarily the easiest character to like. What are some of his good qualities? That’s a very interesting question--mainly because the more I get into performing this role, the more I realize that if as an audience member you never see the ‘other’ side to the villain, you won’t really have much connection to the character, and more than likely won’t believe the performance. I always think back to Meryl Streep’s comments about learning roles: she says that she goes for the reason why a character (especially the seemingly bad ones) acts the way they do. Crown is a bully, sure, but he takes care of Bess the only way he knows how. He loves to fight, for sport, but he’s not a full blooded killer, per se. And lest we forget that during the hurricane, out of all the men asked to go out and save Clara and Jake, Crown is the only one who volunteers. He’s human and humans have flaws, so “good qualities” is somewhat relative, in my opinion. 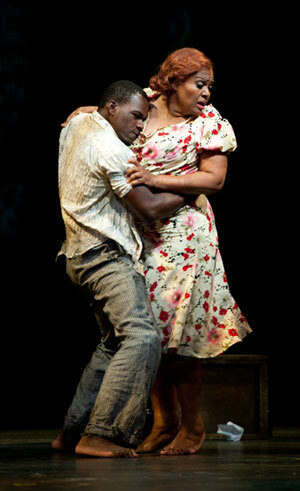 Michael Redding (Crown) and Lisa Daltirus (Bess) in Seattle Opera's production of Porgy and Bess. You recently sang Porgy in Atlanta. What is it like singing that role, versus Crown? Oh gosh...I think if you ask anyone who has performed both these roles (and the progression of singing Crown early on and then singing Porgy later is common), they would say they’d rather sing Porgy any day. Especially the older we get. I think both roles are equally demanding physically--one is either on a crutch or his knees all night, and the other is constantly doing something brutal at a high level of energy--so that's not the difference. However, I would sooner perform Porgy. It’s a much longer sing, but it’s tailor made for the voice. And performing the role of Porgy just always seems to put me in a beautiful place spiritually and emotionally. Simply said, everybody loves Porgy! 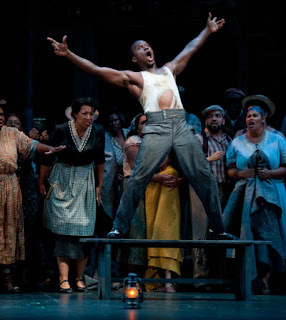 Michael Redding's Crown scandalizes the inhabitants of Catfish Row with his arrogance in the face of the hurricane in Seattle Opera's production of Porgy and Bess. It seems that nearly everyone is familiar with the music of Porgy and Bess, thanks to countless renditions over the years. 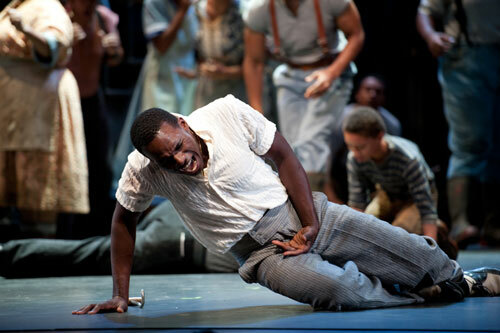 Do you have a favorite performance of a song from Porgy and Bess by a non-opera performer? Nina Simone, by far! Her rendition of “I loves you, Porgy” is incredibly heart-wrenching. It gives the piece an entirely different outlook, which I think Gershwin would have loved! Thanks for another in this fascinaring series of interviews with "Porgy & Bess" singers and others connected with this superb production, which I experienced on opening night; I hope to see it again at least once (hopefully tonite if I can get a ticket; I'm glad it is selling soooo well!!!! Yes, Michael, I also like the aria "My Man's Gone Now", especially as it was so movingly sung by Mary Williams on opening night -- and deservedly got by far the most applause for any aria that evening. Though a male, you, Michael, could still sing this music on a concert program; simply change the title to "My Gal's Gone Now" and transpose to a singable key for you!! Enjoy!! I'm sure your audience will, too!!! And yes, you did choose the best thing about Crown to make him seem likable on at least one point: He is the ONLY person joining Clara on her search for her lost husband, Jake, during the hurricane!! That is really commendable!!! Toi, toi, toi for you and your colleagues on, back or under the stage of "P&B" on this "run"!!! !